The gunshot wounds sustained on the battlefield caused by military ammunition can be different in nature to those usually encountered in the civilian setting. The main difference is that military ammunition has typically higher velocity with therefore greater kinetic energy and consequently potential to destroy tissue. The surgical priorities in the management of gunshot wounds are hemorrhage control, preventing infection, and reconstruction. The extent to which a gunshot wound needs to be surgically explored can be difficult to determine and depends on the likely amount of tissue destruction and the delay between wounding and initial surgical treatment. 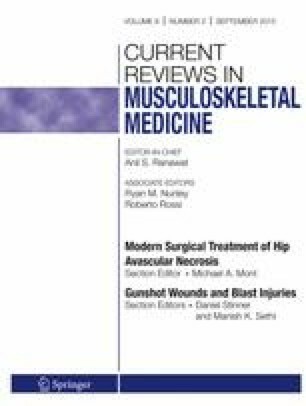 Factors associated with greater energy transfer, e.g., bullet fragmentation and bony fractures, are predictors of increased wound severity and therefore a requirement for more surgical exploration and likely debridement. Gunshot wounds should never be closed primarily; the full range of reconstruction from secondary intention to free tissue transfer may be required. No benefits in any form have been received or will be received from a commercial party related directly or indirectly to the subject of this article. The authors are all serving medical officers in the UK Armed Forces. None of the authors have any conflicts of interest with the subject of this work. The opinions or assertions contained herein are the private views of the authors and are not to be construed as official or as reflecting the views of the Ministry of Defence or Her Majesty’s Government.